We should probably be concerned when newspapers use the “sickness” frame to describe what’s happening in “society” or “nationally”. Note the curious detail about getting a “lover” pregnant – which is irrelevant to “fitness for work” claims (unless the job is sperm donor) but which, to certain readers, signals a type of “immorality” (“out of wedlock” births, via the morality-as-self-discipline frame). Consider the implications of this narrative. If politicians and media (and rightwing pressure groups) do have it right about sickness-benefit claims, then everyone in the country (except for a tiny deserving minority of sickness-benefits recipients) is presumably healthy enough to work a 40-hr week (regardless of the demands of the job, stress, physical affects, etc). The premise is of a society of people so healthy that they are jumping out of bed on Monday mornings in their eagerness to work. So, when newspapers talk of a “sick” society (as they did following the August 2011 riots – see front pages, right), we should be experiencing cognitive dissonance at the very least. But mostly we don’t – because the “societal” sickness frame is already well-established in our brains. Of course, when applied to a country, this frame is about morality, not physical condition. But that doesn’t alter the fact that certain metaphors are implied: remedy, cure, strong medicine, perhaps amputation (if things get really bad), etc. Yes, we should be worried when politicians start talking like this. The prognosis is not good. 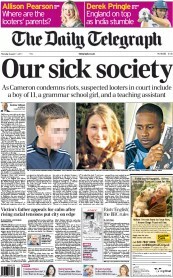 Given the last line, which I put in bold text, it’s interesting to note that only a few days after the headlines ‘ENGLAND IS SICK‘ and ‘OUR SICK SOCIETY‘ (concerning the August 2011 UK riots), two youths were sentenced to 4 years each in prison for creating Facebook pages which failed to incite riots.